Jim’s Interior House Painters Hawthorn delivers a diverse range of services to such a diverse suburb. Hawthorn is understandably sought-after for its prestige and its array of residential properties. From older period homes and Victorian terraces to luxury townhouses and modern new apartments, Hawthorn has it all. Let’s not forget about the bustling commercial hub too. Conveniently serviced by the University, schools, historic churches and a very busy cafe and shopping strip. So, when it comes to painting, there is no job too big or too small, too elaborate or too plain. Jim’s Interior House Painters Hawthorn understand the mood of this charming suburb, and can deliver services and results to match. Just like Hawthorn, Jim’s Interior House Painters Hawthorn have a distinguished reputation. A reputation built on outstanding customer service and high quality. Why trust your valuable asset to anyone else? Why Jim’s Interior House Painters Hawthorn? We live and breathe quality. Everything we use is quality and everything we do is quality. All our painters are highly trained perfectionists. They have an eye for detail and take pride in their work. They won’t rest until you are happy. With years of experience, they know which techniques to apply and which ones are going to look the best. Jim’s Professional Painting Hawthorn only use high quality and reputable products. All of them are backed by the manufacturer’s warranty. Paint products are constantly evolving. We ensure we are always researching new products that are going to achieve the look you desire, as well as give you long lasting results. Jim’s Professional Painting Hawthorn are true professionals in every sense of the word. We look professional, act professional and value a professional relationship with our clients. Our vehicles are and branded and our painters proudly wear their professional Jim’s uniform. You can feel safe knowing that you are dealing with a recognised and trusted business. Painting is our passion, so is providing great customer service. That’s why we strive for a flawless finish whilst keeping the channels of communication open with you along the way. To understand your desired outcome, we take the time to listen to your needs. If you’re not sure about anything, we can brainstorm together and work out a ‘look’ that you will be happy with. 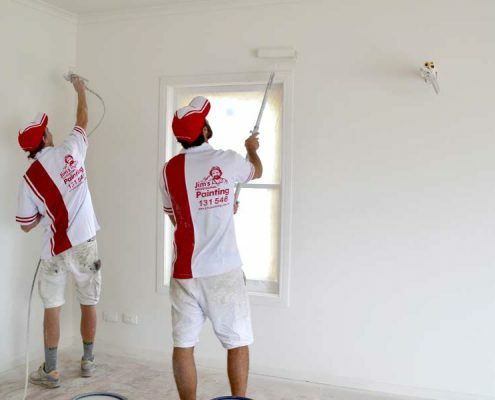 What services can Jim’s Professional Painting Hawthorn provide? Perhaps you have one of the beautiful old period homes in need of a revamp. Don’t stress, a new paint job won’t take away the old-fashion charm of your house. We can replicate the painting style of the era. Your period home will not only look fresh, it will look as though it has withstood the test of time. Alternatively, Jim’s Professional Painting Hawthorn stay up-to-date with current international colour trends and forecasts. Therefore, if you need your new townhouse or apartment decked out in the latest style, we can do it. From offices, to medical suites, to shops to cafes and everything in-between; our painters have the expertise and the resources to handle it. From backyard decks and fences, to staircases and intricate handrails. When timber is handled the right way and expertly painted and protected, the results are stunning! At Jim’s Professional Painting Hawthorn, we believe there are never any problems, only painting solutions. Call us today on 131 546 for an obligation free quote.